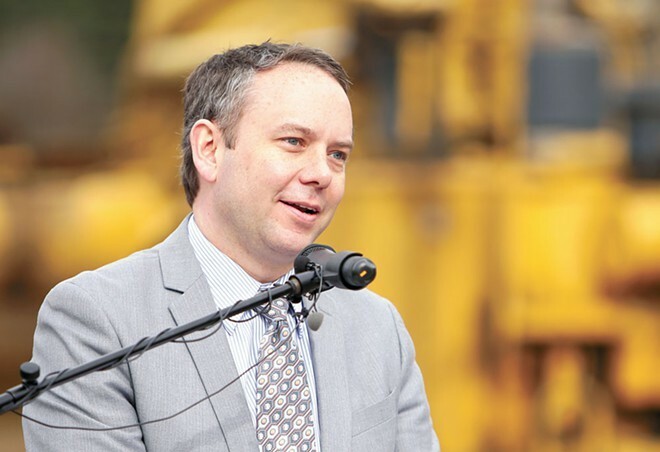 Spokane Mayor David Condon introduced a "three-part plan" Monday to revamp the way the MAYOR'S SALARY is determined and to study the salaries of others in City Hall. Condon is proposing a change to the City Charter, which citizens could be asked to vote on in the spring, that would task the Salary Review Commission with setting his salary. Currently, the city charter dictates that the mayor's salary should match the highest-paid city employee's salary, but the volunteer commission sets city councilmembers' salaries. The charter change would give the commission the authority to decide a starting place for the mayor's salary and when to give raises. Condon says he thinks a $165,000-$175,000 salary is a fair range for his job. The city should also lobby the legislature to allow arbitrators considering city/union contract negotiations to consider cost of living, Condon says. That's been a years-long effort that hasn't gained much traction, but Condon hopes that by asking for just housing costs — not all the factors in cost of living — to be considered, the effort might have a shot in Olympia this year. Third, the administration will pursue a salary survey to see how city employees' salaries "compare to industry standards." The lack of mental health services, especially in rural North Idaho, has been a constant source of frustration for patients and advocates. But last week, a chance to build a new rural COUNSELING CENTER on the Montana border, south of the Clark Fork River, was struck down by the Bonner County Planning and Zoning Commission. Bruce Boudousquie, a mental health counselor, had proposed building five bunk houses on the Clark Fork River, for a largely off-the-grid facility. At the North Idaho Work Academy, 18 young adults struggling with mild mental health issues — like depression or anxiety — would be able to come and stay, free from the distractions, and work on getting their life together. But despite the rural nature of the program, the proposal quickly sparked a firestorm of neighborhood opposition. Many of them, Boudousquie says, were afraid of the facility's clientele, "saying they're going to be a bunch of crazies, they're going to be drug addicts, and will want to break into their homes and steal their prescriptions." Boudousquie says he worked to codify procedures — like promising to drive anybody who wanted to leave to Sandpoint himself — to prevent problems with runaways. But after a contentious public meeting at Hope Elementary School, the county struck down their permit, arguing Boudousquie couldn't guarantee community safety. Theoretically, he could appeal the decision, but doesn't know if he wants to create more community contention. Instead, he's looking across the border, where facilities like the one he proposed don't have to be approved by a zoning board. "That's why all these programs leave Idaho and go to Montana," Boudousquie says. Washington State Patrol detectives continue to lead the investigation into an OFFICER-INVOLVED SHOOTING that wounded a 20-year-old stalking suspect after a high-speed pursuit in North Spokane. Officials noted one Spokane police officer at the scene was wearing a body camera as part of an ongoing pilot program, but the camera was left off. Investigators say a stalking complaint led them to search for Joseph E. Hensz when a pursuit broke out at about 8:30 pm Saturday. Police say Hensz drove at speeds above 100 mph and swerved close to pursuing patrol vehicles. No details have been released regarding the confrontation that led to shots being fired. Hensz continues to recover in the hospital under guard. He faces charges for stalking and possession of a stolen vehicle. Spokane Police Ombudsman Tim Burns says he responded to the scene of the shooting, but received no explanation for the unactivated camera. He acknowledges adopting new technology is an evolving process, but he called the incident a "missed opportunity" that should be reviewed. This article has been updated to accurately reflect how the mayor's salary is set.